← João Biehl and Peter Locke on "Deleuze and the Anthropology of Becoming"
It seems like there’s another special issue coming out every other day recently. The latest is an issue of Medical Anthropology: Cross-Cultural Studies in Health and Illness on “Embodiment and its Extremes” guest edited by Karen-Sue Taussig and by frequent Somatosphere contributor Matthew Wolf-Meyer. Emergent conditions of life at the end of the first decade of the twenty-first century create new opportunities and challenges for medical anthropology. 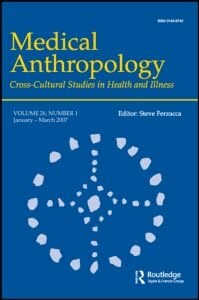 The articles included in this special issue of Medical Anthropology suggest four areas that call out for more attention: the changing scientific and philosophical status of the human, including definitions of life and biology more broadly; the material consequences of anticipatory fictions; the expanding and intensifying forces invested in the production of bodies; and the emergent and historical conditions shaping expectations and experiences of bodies as they are managed and lived. In elaborating the significance of these issues, we provide an introduction to the articles included in this special issue and point to how the contributions to this collection offer models for approaching emergent forms of life. In the early 1980s, unprecedented numbers of gay men and intravenous drug users began dying of what would later become known as HIV/AIDS. What the HIV/AIDS corpse posed was a direct challenge to the institutional controls developed by funeral directors to normalize and transform the dead body. How the funeral service industry reacted and changed in response to the emergence of the HIV/AIDS corpse offers an opportunity to re-examine the productive potential of the dead human body. My article examines the epidemic’s production of what I call the HIV/AIDS corpse, and the institutional affects those corpses had on the US funeral service industry. The theoretical concept I use to analyze the productive qualities of the HIV/AIDS corpse is the technologies of the corpse. These technologies are the machines, laws, and institutions that control the corpse by classifying, organizing, and physically transforming it. What emerges from the institutional challenges posed by the HIV/AIDS corpse is a specific kind of dead body that offers political possibilities for both the concept of a queer body and the broader subject of human death. In this article I explore the different orientations to time experienced by clinicians and patients in the US Armed Forces Amputee Patient Care Program at Walter Reed Army Medical Center in Washington DC. In structuring, describing, and working with patients, clinicians rely on a rehabilitative program that is embedded in a narrative notion of time. This approach seeks to embed the grievous wounds patients have sustained along a trajectory of injured to well. Patients are often eager to adopt this approach to their injury but in many cases find that the linear flow of time, upon which this clinical approach relies, is not matched by their experience. Instead the past, the present, and the future can flow together so that patients are simultaneously experiencing these three time orientations. This can create the potential for misunderstanding and conflict between clinicians over adherence and the meaning of a good rehabilitative outcome. Using data from an ethnographic study of American astronautics, I argue that, in an inversion of the usual clinical model, astronaut medical subjecthood is fundamentally environmental rather than biological. In extreme environments like outer space, the concept of environment cannot be bracketed out from life processes; as a result, investments of power and knowledge shift from life itself to the sites of interface among living things, technologies, and environments. To illustrate what this means on the ground, I describe space biomedicine as a form of environmental medicine that seeks to optimize and manage technically enabled human ecologies where life and environment are dually problematized. I provide two examples of what I term its ecobiopolitical strategies: creating a new “space normal” physiological category and situating humans as at-risk elements within integrated biological/technological/environmental systems. This article explores American conceptualizations of finance, the future, the limits of biological time, and the possibilities of biotechnoscience through an investigation of the social world of cryonics—the freezing of the dead with the hope of future revival. I describe some of the cosmologies of life, death, time, and the management of the future that circulate within cryonics communities, and I draw out relationships between cryonics practices and discourses and more common forms of personal future management prevalent within American neoliberal capitalism. I also illustrate similarities and differences between cryonics and more mainstream biomedical technologies. In doing so, I argue that cryonics is one American manifestation of anxieties about aging, time, and the future. I investigate the impact of biotechnologies on self-making and biosociality, and argue that crafting of selves can be deeply entwined with practices of investment or hope in the future of biomedicine and technology. Raikhel E. "Embodiment and its Extremes": a special issue of Medical Anthropology. Somatosphere. 2010. Available at: http://somatosphere.net/2010/embodiment-and-its-extremes-special.html/. Accessed April 26, 2019. Raikhel, Eugene. 2010. "Embodiment and its Extremes": a special issue of Medical Anthropology. Somatosphere. http://somatosphere.net/2010/embodiment-and-its-extremes-special.html/ (accessed April 26, 2019).